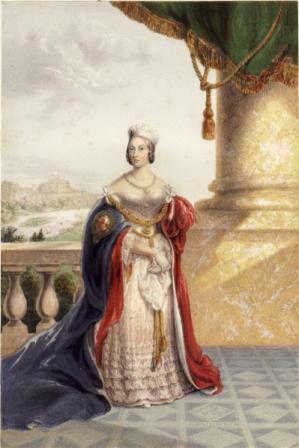 Published by George Baxter in 1848, this print was also known as Her Most Gracious Majesty the Queen. Queen Victoria is on a balcony with Windsor Castle and the river in the distance. This print was used as an illustration for the outside of needle-boxes, and it is there stated “the portrait on the lid of the box represents Her Majesty Queen Victoria, in the dress and robes of the Order of the Garter worn at the Christening of the Prince of Wales” (afterwards King Edward VII). The print was very popular, and some hundreds of thousands were sold. It was published with square or dome top on several different embossed and stamped mounts as well as unmounted. The figure depicted is almost an exact copy of the one shown in the well-known painting of the “Baptism of the Prince of Wales in St. George’s Chapel, Windsor,” by Sir George Hayter. Baxter Process Print, size 6 x 4 inches. It was produced from a plate and thirteen blocks, and was originally sold for 2s.